Anonymous_c4346019: I sincerely hope the Pakatan Harapan leadership would discuss important policy matters before making any announcement. Stop flip-flopping on important matters which cause unhappiness among the public. It looks like there is no cohesiveness within the new government. Please stop this at once. Subang Jaya Voter: Leaders who condone this irresponsible habit of not servicing a loan are not fit to be leaders of Malaysia Baru. They should not think of just their constituencies, but for the best interest of the nation and the future generation. Anonymous_ce778cf8: Harapan, we voted you in so as to right the wrongs and not allow the wrongs to be perpetuated. So MP Anwar Ibrahim and Youth and Sports Minister Syed Saddiq Syed Abdul Rahman, just let the National Higher Education Fund Corporation (PTPTN) do its job so that other needy students have the opportunity to pursue higher education as well. Gulengtu: The repayment of PTPTN loan will never get implemented as there is no political will to do so. Every politician wants to be a good guy and all these borrowers are taking advantage of the situation. When are they going to take responsibility to pay back what they have borrowed? This sick culture of a free lunch must be eradicated and it starts from when they are young. Change For The Better: Incredible. These are leaders who did not honour their commitment in the first place. I understand that they are your voter base but surely there must come a time when this free ride must end. What hope is there for this country if these so-called graduates don't want to honour a commitment, particularly if they are already working as it is a salary-based deduction? Mechi: One of BN’s downfalls was refusing to take unpopular decisions like this one. Good politicians are rare but they are prepared to take unpopular decisions, be it Abraham Lincoln, Lee Kuan Yew or Nelson Mandela. Take note Anwar and Syed Saddiq. This is a new Malaysia. Kutan: Indeed, a government and its leaders must lead, not be followers. Populist policies will always backfire sooner or later. Ex-Wfw: I think the overall scheme is fair, maybe it should be kept at 10 percent at the higher end; unless some think that such loan contracts were meant to be thrown into the quagmire. Where circumstances after detailed checking proved that the repayment rate should be lowered, a guideline should be given. After tertiary education, surely these people can think and plan for themselves; if not, then our education has failed us miserably. Mighty Righteous: For the Malaysian workforce to be world class, honesty, humility, civic-mindedness and working hard are must-have characters. Malaysian Trades Union Congress (MTUC) president Abdul Halim Mansor, the borrowers must pay back what they owe. In the past, they avoided paying back, but now they have to do so. It is only fair that they do so in order to allow future generations to be able to further their studies using the PTPTN scheme as well. 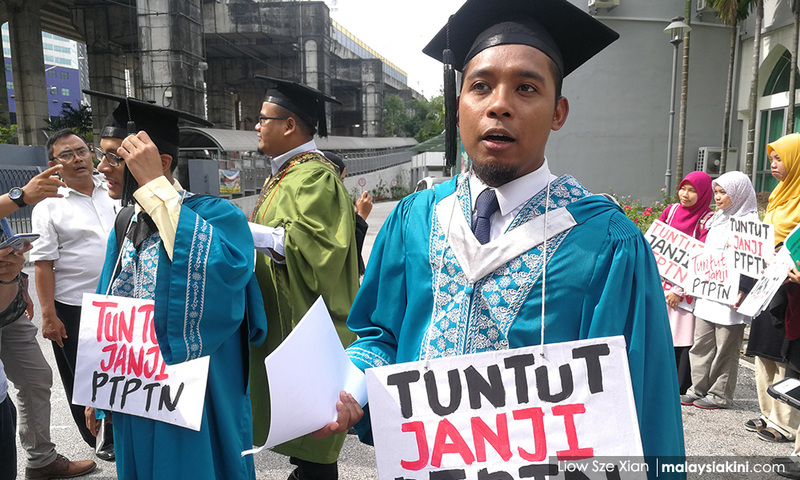 If MTUC does not teach the workforce to honour debt, what is the use of MTUC? Anonymous_1528103253: What you owe, you have to return. However, looking at the repayment scheme, it will be tough for many who have to pay income tax and also repay the loan. KKKSSS: PTPTN has to obtain consent from both borrowers and their employers? Wish this concept applies to bank loans too - need consent from the borrower to collect payment, how about that? Just Sharing: How about the loan agreements that the borrowers signed with PTPTN for the repayment schedule? Will the agreement become void? The agreement is based on fixed monthly repayment, not based on income levels. Can those who have been paying their monthly payments sue PTPTN for not honouring the agreement now? Anonymous_1c548bfe: It's so easy to say that with this amount of salary, one should be able to afford the percentage mentioned with lifestyle adjustments. Sure, everyone has commitments but the amounts involved are not the same. Someone earning RM4,000 with a family to feed is different from someone earning the same amount living with parents who are still able-bodied and working. Appum: The repayments look very fair and considerate. The whole basis is that if you have been assisted and have borrowed and that has helped you gain your objective of obtaining your degree, you will have to pay back. Some of us have borrowed from the Penang state government in the 1970s and after graduation, we gladly, in appreciation, paid up in full. PTPTN must ensure this pay-up policy is rendered to all borrowers with no exception unless clearly expressed in its terms and conditions prior to borrowing. We even hear some earning RM8,000 or more per month complaining about the 15 percent deduction. Come on, everyone has commitments, you just have to manage your budget, forgo some comfort in life and fulfil your duty to pay up so that others can be assisted as well.